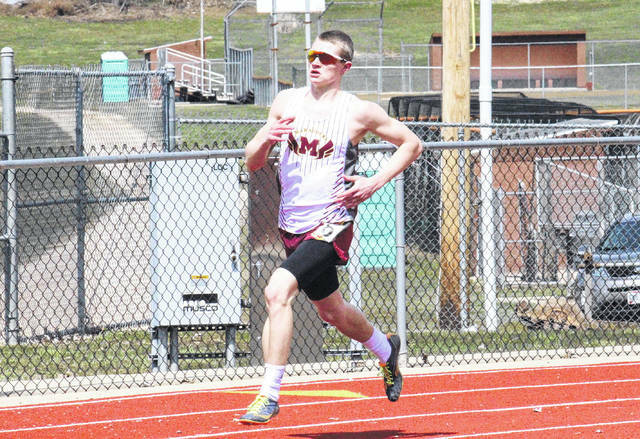 Meigs junior Cole Adams runs in the Rocky Brands Invitational on March 31 in Nelsonville, Ohio. LOGAN, Ohio — The Marauders took seventh, while the Lady Marauders were eighth at the Mingo Relays, hosted by Logan High School on Friday in Hocking County. The boys team competition had Logan and Reynoldsburg tie for first place with 88 points apiece. Warren was third with 80.5, followed by Marietta (65), Athens (62.5) and Morgan (38). Meigs was seventh with a total of 31, while Maysville rounded out the eight-team field with 16. The best finish for the MHS boys was third place, in the 4x200m relay and in the 800m sprint medley. The 4x200m relay team of Jacob Perry, Cole Adams, Zach Bartrum and Cole Betzing posted a time of 1:38.25, while the 800m sprint medley team of Perry, Adams, Bartrum and Landon Acree, had a time of 1:43.21. The duo of Lane Cullums and Matthew Jackson was fourth in the shot put relay with a combined distance of 71-3, while the team of Acree and Brody Hawley was fourth in the pole vault relay at 9-00. The 1600m sprint medley team of Cullums, Cole Betzing, Theo McElroy and Magnus McDaniel was fifth with a time of 4:24.87, while the 4x100m quartet of Perry, Adams, Bartrum and Devon Hawley was fifth with a time of 47.48. The long jump duo of Adams and Perry posted a sixth place distance of 33-7.25, while the distance medley team of Christian Jones, Levi Chapman, Brody Hawley and Joseph Cotterill had a sixth place time of 15:14,04. Athens won the girls team title with a 105, while Warren and Logan tied for second with 78 apiece. Marietta was fourth with a score of 70, followed by Maysville (64), Morgan (31), and Reynoldsburg (24.5). The Lady Marauders finished eighth with a score of 19. The Meigs girls’ best finish was third place in the long jump relay, with the team of Kassidy Betzing and Madison Cremeans combining for a distance of 29-4. The Lady Marauders’ team of Cremeans, Kassidy Betzing, Lydia Edwards and Madison Fields was fifth in the 1600m sprint medley with a time of 5:14.03, and sixth in the 4x200m relay with a time of 2:04.14. The team of Caroline Roush and Sydney Kennedy was sixth in the shot put relay at 56-5, while the quartet of Caitlyn Rest, Carmen Doherty, Kacie Ballard and Ariann Sizemore was sixth in the 4x800m relay at 13:37.63. Meigs is scheduled to compete again on Tuesday at Jackson. Visit www.baumspage.com for complete results of the 2018 Mingo Relays. https://www.mydailytribune.com/wp-content/uploads/sites/42/2018/04/web1_4.10-MHS-Adams.jpgMeigs junior Cole Adams runs in the Rocky Brands Invitational on March 31 in Nelsonville, Ohio.